“Strangerland” marks Nicole Kidman’s first starring role in an independent Australian film since 1989’s “Dead Calm,” the movie that put her on the map. Over the many years since Philip Noyce’s claustrophobic thriller on the high seas, Kidman consistently has surprised us and taken chances in a variety of parts. She has dared to visit dark and disturbing places to explore the complicated psychologies of her characters. This is certainly true, as well, in “Strangerland,” in which she plays a wife and mother devastated by the disappearance of her two children from a middle-of-nowhere desert town. If only her performance were in the service of a better film. Director Kim Farrant’s debut feature is beautifully shot and offers some powerful, well-acted moments from a strong cast, but it’s just relentlessly dreary. Despite some striking, widescreen imagery from Irish cinematographer PJ Dillon—including shimmering sunsets, craggy canyons and a doozy of a dust storm—“Strangerland” is, more often than not, lifeless and languid. It’s a missing-kid mystery with some red herrings and misplaced mysticism, all of which leads to an ending that’s coy in its intentional ambiguity and ultimately unsatisfying. There’s tension at the start, though, with the help of some effectively minimalist sound design: the thrum of a ceiling fan, the scratch of a pencil on a crossword puzzle, a fly buzzing overhead in the kitchen. Working from a script by Fiona Seres and Michael Kinirons, Farrant creates a vivid sense of loneliness and isolation. You actually might think you’ve walked into a zombie movie by mistake; its opening sequence features a pre-teen boy wandering by himself through the silent streets and desolate remnants of civilization in a small, dusty town. This is fictional Nathgari, where the Parker family reluctantly moved recently. Father Matthew (Joseph Fiennes) is a pharmacist who’s away at work most of the day. That leaves Kidman’s Catherine to care for their two children: angsty, adolescent Tommy (Nicholas Hamilton) and his 15-year-old sister, the sultry Lily (Maddison Brown). There are allusions to a scandal involving this young woman, which forced the family to relocate, but her barely-there clothing and provocative demeanor provide early clues. It’s hot, and they’re bored, so they do what kids do all over the world when they’re hot and bored: spend their days at the town’s makeshift skate park. It’s a bleak place dotted with worn-out furniture, trashed shipping containers and disenfranchised youth, including a vaguely hunky dude named Steve (Sean Keenan) with an ominous serpent tattoo. One night, out of nowhere, Tommy and Lily get out of their beds, leave the house and wander into the vast unknown. The police detective assigned to the case, Rae (Hugo Weaving), turns to Steve as an early suspect. But there’s also Burtie (Meyne Wyatt), a slow-minded but good-hearted Aboriginal man who’s been helping out around the Parkers’ house. And there is a dust storm: a meteorological act of mythical proportions that covers everything and everyone in a thick, orange haze, physically and psychologically. Any or all of these may have been factors in the kids’ ongoing disappearance. Or not. Lily’s diary, which Catherine finds hidden in her bedroom, further confuses matters—as does Lily’s wispy poetry, which we hear in breathy voiceover. Farrant aims to explore several dynamics and themes at once here: loss of innocence, indigenous mythology, societal judgment and a marriage in peril. (Matthew and Catherine’s bond already was a tenuous one—they routinely sleep in separate bedrooms—but it rips apart once the children are gone.) 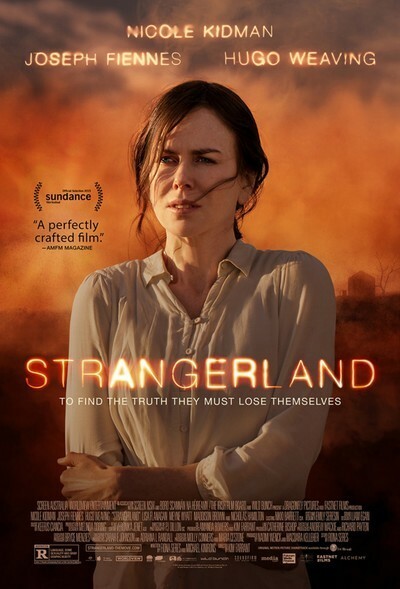 Despite the film’s prevailing quiet and understatement, though, “Strangerland” tries to encompass too much, which makes it feel scattered and unfocused. A monotonous feeling of blame and guilt is constant, however. Kidman has several strong moments with Weaving, who gives a commanding yet sympathetic performance as a man who’s suffered losses of his own. Her scenes with Fiennes never have that kind of spark, though, mainly because his primary character trait is stoicism, punctuated by a couple of impetuous acts of bloody violence. But her steady collapse provides the film’s spine and is the main element that keeps the film watchable, even as it wanders into uncomfortable territory and drags to its conclusion. That a mother would become increasingly bereft over the disappearance of her children is more than understandable, but in Kidman’s hands, this woman lays herself bare in more ways than one. It’s unsettling, but she can only do so much.